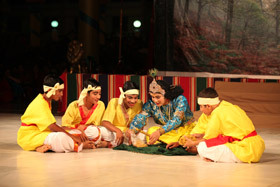 The students of the Prasanthi Nilayam campus of the Institute were scheduled to present a drama on January 13 in the Divine Presence as they do so every year. 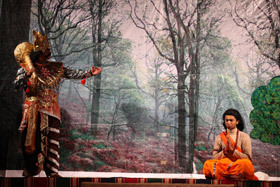 A beautiful backdrop and a gigantic stage had been set up in the Sai Kulwant Hall and the Bhajan Hall was populated with the actors in the drama in their complete costumes. 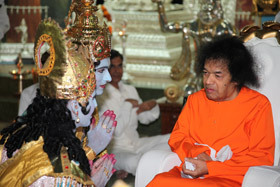 Shortly after 5:30 p.m., Swami arrived for darshan in the car. 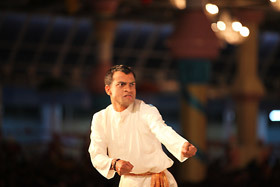 Moving through the ladies’ and gents’ side, Swami entered the portico. 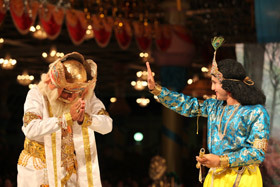 He was told that all the actors were in the Bhajan Hall and He was very enthusiastic to go there. He entered the Bhajan Hall from the front and His eyes immediately widened as He asked, “What role are you playing?” The boys have very intelligently arrayed themselves in rows so that Swami could easily move amidst them. And Swami fulfilled their desire by moving amidst the lines. He was asking about their roles in the drama and the boys were naturally delighting in their explanations to Him. Swami gave a few of them Vibhuti packets and they were doubly delighted. 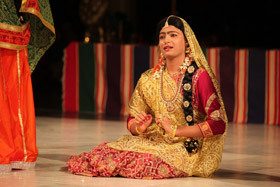 There was a ladies’ section too where ‘Radha’, ‘Yashoda’, ‘Devaki’ and the ‘gopikas’ were seated. 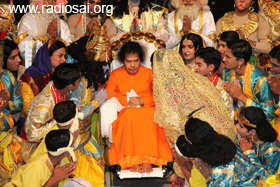 Swami blessed them and smiled at those boys. 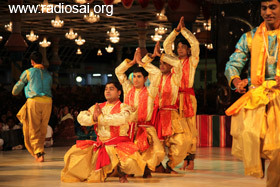 He moved through the four rows in the entire Bhajan Hall. Exiting from the back door, Swami moved on to the stage. He saw the long line of birthday boys with their trays and smiling gently, He called them. They moved to Him one by one and Swami blessed them. 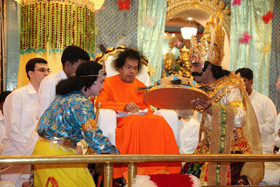 Sprinkling the akshatha grains on them and accepting their letters, Swami granted them padanamaskar. He also gifted a few of them with Vibhuti packets. 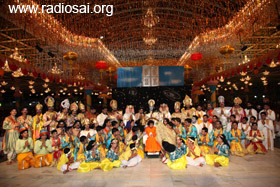 More than a dozen boys were thus blessed after which He looked at one of the students and said, “Let the drama start!” The bhajans immediately came to a halt and a few representatives came forward with a card. Swami had a look at it and blessed the drama to begin. 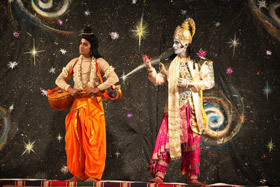 The drama brought out the inner meaning of Bhagavatamu which Swami has expounded as Bhakti, Gyana, Vairagya, Tatva and Mukti. Swami says, “Bhagavatamu chadivithe, baagaavutaavu” meaning that if one reads the Bhagavatam, one automatically becomes good. Lord Vishnu detailed to the sage Narada on each of these aspects. 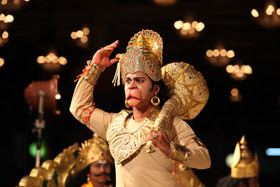 The epochal devotion of Hanuman was depicted for Bhakti and the complete wisdom of Lord Krishna when He cleared the ignorance of the Creator, Brahma, was the example for Jnana. (Read this story under the head Brahma Tests Krishna from our archives). 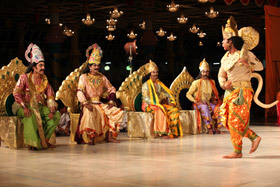 Vairagya (detachment) was depicted through a song where Lord Vishnu says that those who have not tasted Anuraaga (love) cannot know Vairagya. The examples of the mother and foster mother of Krishna, Devaki and Yashoda were shown beautifully. Tatva was depicted through the story of Nachiketa seeking the secret of life and the mystery of death from the Lord of death, Yama. As it came to the explanation of Mukti, Lord Vishnu says, “This is so poignant that I do not know whether I myself would be able to withstand it.” Then, the merger of Radha Devi into her beloved Lord Krishna was shown. As if in agreement to what Lord Vishnu said, Swami was so moved and it seemed that He was not able to withstand the pining of that selfless devotee and lover of God. As Radha sang out, “Paata paadu maa Krishna”, Swami began to lip the song too. It was the most poignant scene of the drama. 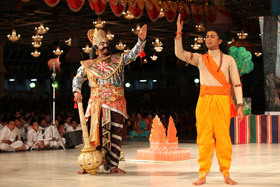 After that, the final formation was made with a song which had been derived from Swami’s writings about the Bhagavatham. Swami told the photographer to take a picture of the formation. He did so and showed the picture to Swami on his camera. 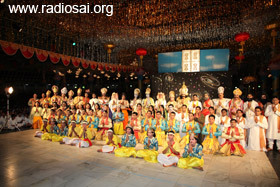 Swami nodded to say that it was not good and he said, “Swami, the grandeur comes only if You are there.” Swami then moved down the stage and posed with the participants for photographs. 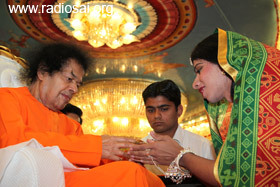 He moved up the stage later and blessed prasadam for distribution. After this He asked for aarthi to begin and as that went on, He personally gave all the participants the prasadam from His own Divine hands. 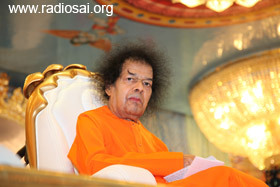 Swami then blessed all and retired to Yajur Mandiram at 7:35 p.m.